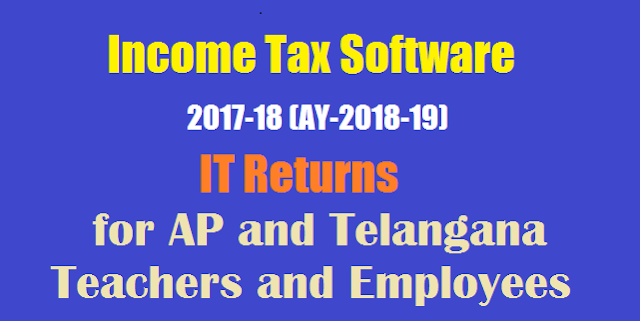 Income Tax Software 2017-18 IT returns for AP, Telangana/TS Teachers and Employees Latest Income Tax Calculator for FY 2017-18 [AY 2018-19] Excel Download, Income Tax Slab for FY 2017-18 : Income Tax Software 2018-19 IT returns for AP and Telangana Teachers and Employees. Advance pay deductions for IT returns 2018-19 financial year. KSS Prasad, Ramanjaneyulu, Seshadri, Radha Gana Software trail version. How to Calculate Income Tax from Income Tax Slabs? Income Tax Calculator for Financial Year (FY) 2017-18 / Assessment Year (AY) 2018-19 in Excel Format after considering the proposed amendment in Tax Rates, Deductions and Rebates vide Union Budget 2017-18.